Let us first get to the point. Devil Dave's tastes like the bloody mary served on a writer's train journey across middle America. The classic, mildly spiced recipe, convenient packaging, and vegan/gluten free friendliness make it perfect for making one off cocktails on the go. 1. It's a Solid Classic Bloody Mary. Imagine yourself on a train. Not a worker bee filled commuter train down the New Jersey corridor. But a tourist train filled with fondness for olden times and a lack of time bound sensitivity. The Spring sun caresses fields of grass outside your second floor train seat. And you've just sat down with your $6 baby bottle of Absolut, a can of Sacramento tomato juice, and a cup of ice from the bar car. You pull a Devil Dave's stick pack out of your travel bag and mix a classic bloody mary while still immersed in a sun touched cloud of ease. This is what Devil Dave's tastes like. 2. Ryan is One Hell of a Tenacious Guy. I could say Ryan himself holds three educational degrees and a long history of food and beverage experience. I could also say Ryan quickly made his rounds through the bloody mary community eliciting much buzz from my fellow bloody mary enthusiasts. But I will settle on this. Ryan is quite literally one of the most tenacious bloody mary purveyors I've had the pleasure of working with. This man does not give up, slow down, or waver in any way. So you might as well jump on his bloody mary stick filled wagon. It's in stick form. Yes, like a Crystal Light pack, but for day drinkers. Also, you'll no longer have to carry around all those bottles of ingredients, lemon wedges, or salt and pepper shakers on camping trips, picnics, or, say, trips to your mimosa drinking friend's house. 4. It's Eco-Friendly, Vegan, and Gluten-Free. Yes, Devil Dave's comes in a convenient biodegradable stick pack. Open it up, use it, toss it in the recycling. Plus, all those vegan and gluten free day drinkers out there need not worry about unwanted ingredients. 5. You can cook with it. No really, you can. Unlike liquid mixes that may say they can be used for cooking, the convenience of this pre-made spice blend actually does make quick work of many legit cooking recipes. Below is just such an example from owner Ryan himself. You can also check out the Devil Dave's Blog for more recipes coming soon. Mix ingredients well, and pour over cleaned and dry chicken wings. Cover, chill for at least 6 hours. Overnight works best. Mix ingredients in heat proof bowl. Set aside. Preheat oven to 400º F. The marinade should be soaked into the wings. Pour entire contents of bowl directly onto paper lined sheet tray. Spread the wings out evenly on sheet tray. Roast in oven for 8-10 minutes. You are only par cooking them, but they should not be raw. Let them rest while you preheat your grill and make your finishing sauce! Heat grill to sear temperature - usually 600º - 800º F. Place the par cooked wings on the grill to sear. You should get nice grill marks from the sugars in the ingredients. Make sure they don't burn! Grill for several minutes, moving around to get even charring. Toss well, in wing sauce. Plate with your favorite dipping sauce. Enjoy with a fresh Devil Daves Michelada (recipe coming soon). If you'd like to be one of the first to try Devil Dave's, head over to Ryan's Kickstarter page to get in on some sweet rewards, including signed copies of The Drunken Tomato guide books! 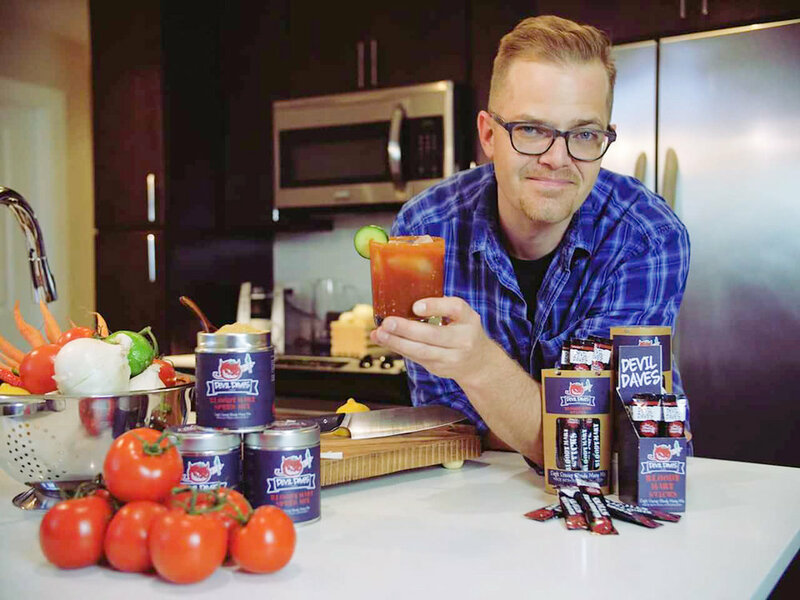 Have you tried Devil Dave's Bloody Mary Sticks? Let us know what you think in the comments below!